Sounds Like: Old school dark alt-rock fused with metal, industrial, classical, and electronic music. Passionate but reserved. Aggressive but passive. Emotional yet devoid. Brutal but eloquent. Fluid but broken. All of these comparisons summarize nearly a 15-year run for dark rock outfit Fifteenth Summer. Birthed in early 1999 by two kids with dreams of grandeur, this band rocketed out of the garage and after years of hard work and dedication now shares the stage with national acts like VAST and Cross Culture. In 2003 after years of playing the Atlanta club circuit Fifteenth Summer began work on their first EP, entitled "Fallen Angels" at Master Your Sound Studios in Louisville, Kentucky. Away from the hustle and bustle of the Atlanta scene, the band found the perfect setting to hone their raw sound and further sculpt their musical image. “Fallen Angels” would go on to sell over 700 copies and the band supported it with countless shows over the next four years. In 2007, Fifteenth Summer tapped Nickel and Dime Sound Studios in Atlanta to work on their next EP, entitled “The Long Goodbye.” The EP consisted of four new songs and would become later become a digital hit on Facebook and Myspace, with over 8,000 downloads between both sites. 2007 also saw Fifteenth Summer opening for national touring act VAST, one of the band’s foremost influences, and Cross Culture. 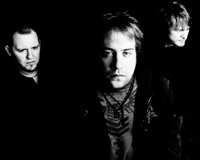 After a short hiatus Fifteenth Summer regrouped in 2010 and began work on their first full-length album entitled “Shades of Grey.” The album is currently was produced at LedBelly Sound Studio in Dawsonville, and was mastered by the legendary Rodney Mills at Rodney Mills Masterhouse in Atlanta. It is now out on all major online retailers. • In August 2007, shared the stage with national touring acts VAST and Cross Culture. • Airplay on WRAS 88.5 “Album 88” in Atlanta, as well as “Locals Only” on WNNX 99.7 “99X” Atlanta. • Played the Emergenza Musical Festival in 2006 at Vinyl Atlanta. • “The Long Goodbye” used in a Ken Stanton radio commercial.